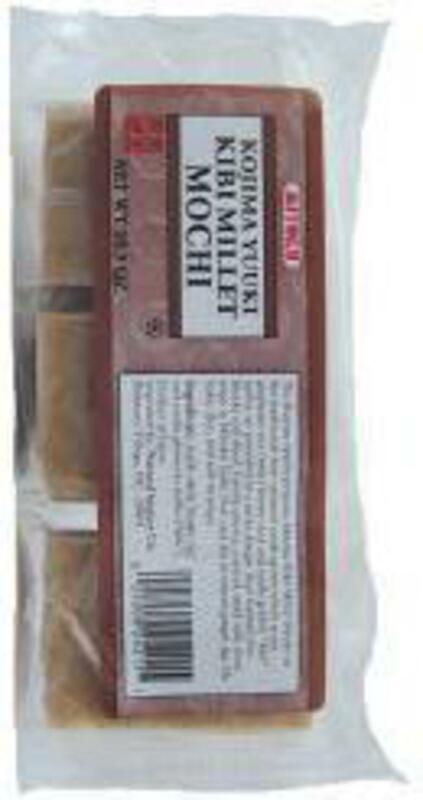 Natural Import Company - Traditional Japanese foods - Mitoku Yuuki Millet Mochi - 10.5 oz. Mitoku Yuuki Millet Mochi - 10.5 oz. Ingredients: yuuki-grown whole-grain sweet brown rice and yuuki Japanese millet (glutinous millet). Mitoku Yuuki Millet Brown Rice Mochi is prepared in the traditional way: steamed whole grain glutinous rice (sweet brown rice) and glutinous millet are pounded to a sticky dough, then formed into blocks and dried. When cooked, these "cakes" soften and puff up, becoming delectably moist and chewy. A naturally sweet convenience food with whole grain goodness. The glutinous millet adds nutrition and distinctive taste.